Well that’s a wrap! The four national championships being hosted by RQYS between 5 and 18 January 2019 have come to an end. A huge thank you to the Internationals Moths, Sabres, RL24s and International Etchells for bringing the fun back to RQ yet again. Within the two weeks, we had just over 200 competing sailors in the 27 Sabres, 35 Moths, 15 RL24s and 26 Etchells that battled it out on the bay for National and Age Category Championships. The International Moth is a single-handed development class boat, and these rules are open class rules. The intention of these rules is to give the designer and builder the fullest liberty in design and construction, within these rules to develop and produce faster boats. LOA must not exceed 3355mm (~11ft) for the hull, plus, easily removable bow and stern extensions up to 500mm each (ie bowsprit and rudder gantry). Sail area must not exceed 8.25m2, mast must not exceed 6250mm, and it cannot be a multihull. 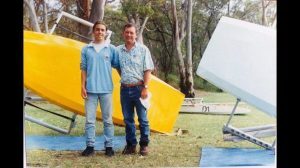 There was 1 Scow Moth (different shape hull to the standard foiling moths) which belongs to Ian Sim, who has been to every nationals for around 35 years. After starting out at Middle Harbour VJ Sailing Club, Ian got a wingless scow and started racing with friends at Balmoral. One of his Moths was reputedly called Who Cares.The scow he has now was built by Les’ brother Mark being the first boat he built after his terrible work accident using his old plywood one as a plug. The ply one was designed & built by Renold La Fevre for the Botany Bay worlds. The moths had AP up onshore a few times during the regatta as the wind was struggling to increase past 7 knots on a few days (which is below minimum for Foiling Moths) on the Southern Course. Thank you to the main organiser and RQYS member, James Hallam for the assistance in organising the event and bringing the very well-mannered ‘moth frothers’ to RQYS. In the Sabre fleet 27 boats, some of whom were not usually sabre sailors and had very little training in the single-handed dinghy prior to the event – Aaron Goldwater (22nd overall) from Resilience Sailing who won a Mast at Presentation, and Jason “Goggles” Ruckert (21st overall) who is usually a sportboat/yacht sailor. The Sabre lay-day was on Wednesday which sparked conversation amongst the fleet about the Sabres doing WAGS on their own start however this did not progress further as the fleet elected to rest rather than do a passage race in a dinghy. A big thank you to the Qld Sabre Class Association – particularly Andrew Lovell, Andrew Matheson and Keith Wilson, for all of their help running the regatta and organisation in preparation of the event. The RL24s were a great crowd to have at the club. Most RL24s camped on the Eastern Lawn while the 24-foot boats were docked up in the VIP Jetty for the duration of the regatta. Many crews were made up of mixed families (two adults and two kids) and most boats travelled interstate to attend the event. Thank you to Darryn, Wayne and Paul for all the pre-event organisation and for bringing such a great group of people to the club!